Summon the Dremora pirate, Velehk Sain. Note: This quest does not appear in your journal. Discover a strange gauntlet in The Midden Dark. Investigate the surrounding area to find a key and an incident report. Retrieve the missing rings mentioned, located in the Arcanaeum. Return to the gauntlet and place the rings in their correct places. Decide whether to kill or help release Velehk Sain. While exploring The Midden Dark beneath the College of Winterhold, you will discover a circular room littered with blood and skeletons. In the center of the room sits a small statue in the form of a gauntlet. On the table nearby there will be a key and an incident report which describes a failed summoning ritual and four rings. The rings mentioned can be found in a locked chest, located in the Arcanaeum. 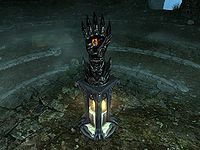 You must use the provided key (or just pick the lock) in order to obtain the four ornamental rings: Pithi's Ring, Treoy's Ring, Balwen's Ring, and Katarina's Ring. 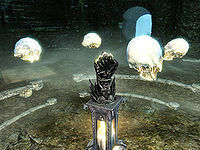 Once you have obtained the rings, return to the gauntlet in the Midden Dark. Note that the rings are owned, and removing them from the chest is considered stealing. Place the rings on the gauntlet by activating each finger. On the Index Finger goes Katarina's Ring, on the Middle Finger goes Treoy's Ring, on the Ring Finger goes Balwen's Ring, and on the Little Finger goes Pithi's Ring. ... Velehk Sain will be summoned. Release: If you release him, he will vanish and you will receive Velehk Sain's Treasure Map. 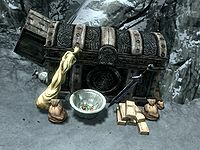 The map leads to a hidden stash of treasure (leveled general treasure), located west-northwest of Winterhold, and north of Saarthal, on an island with a statue of Talos. Note that there are several statues of Talos in the surrounding area; the one you need is the one where the statue is at the very apex of the small island. (map). The treasure is magically hidden and will only reveal itself if Velehk is released. The treasure is conjured by your proximity, you will not see it from a distance. 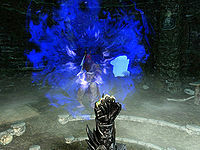 Kill: You can opt to kill him and loot his corpse for two scimitars, a daedra heart, Hammerfell garb, and Redguard boots. Unlike other quest items, the rings can be removed from your inventory. Velehk Sain cannot be summoned without the rings, so you should be careful not to misplace them. The rings are ornamental and cannot be worn by you. They will be stored with miscellaneous items in your inventory. If you are quick enough and have a strong enough weapon, you can release him, get the map, and then kill him as he disappears. His body will vanish before it can be looted. However, if you exit the conversation after you pick the option to release him and before you get the map, you can kill him quickly enough for his body to be looted. It is, however, possible to pickpocket Velehk Sain for his weapons and armor (though not the Daedra Heart, obviously) with the Misdirection and Perfect Touch perks. Simply kneel behind the spot where he appears, go through the dialogue as if you're going to let him go, and leave the conversation immediately after you select "Velehk Sain I release you." Then, pickpocket him for all available items. This will cause a glitch however which makes him start all the dialogue over again. Go through and release him once again, then claim the treasure. The game doesn't trigger the treasure to appear as soon as you select the "Velehk Sain, I release you" dialogue option. Instead, the trigger is at the end of the dialogue line, after Sain says "See you on the other side, mortal". The implication of this is that if you're pressing the activate button to skip through the dialogue more quickly, you can actually cause the game to not trigger the treasure to appear. If you're electing to take the deal, allow Sain to speak instead of skipping through the dialogue to ensure you get the treasure. If Urag gro-Shub catches you stealing the rings from the chest in The Arcaneum, he will react by turning hostile, and remove them from your inventory. At that point, they will no longer be obtainable, as they cannot be pickpocketed back. The only way to solve this is to reload a previous save. All of the quest stages are empty: 0, 10, 40, 50, 75, 80, 100. On the PC, it is possible to use the console to advance through the quest by entering setstage dunMidden01QST stage, where stage is the number of the stage you wish to complete. It is not possible to un-complete (i.e. go back) quest stages, but it is possible to clear all stages of the quest using resetquest dunMidden01QST. This page was last modified on 19 March 2019, at 12:54.